On 29th and 30th March we will be running a Work Weekend, where we are asking for volunteers to help us with some painting, putting up of shelves, garden tidying and various other small but vital jobs. If you’d like to take part - even if only for a hour - please let us know. BBQ food and refreshments will be provided by the CCC Club. Posted in Uncategorized on March 22, 2014 by Jake Berger. We have now heard from OFSTED, and they are processing our application. The Breakfast club is getting more and more interest, but we still expect to have spaces available. Check out our latest flyer. We hope to open the CCC Club on 22nd April 2014 in order to be able to provide Breakfast and After-School care for the whole summer term. We will confirm this date as soon as possible. As soon as we have OFSTED approval, we will let you know about the process for submitting formal applications for places at the CCC Club and the 'Registration Date’ - the date / time after which we will accept applications. Registration will be on a first-come-first-served basis, though we will ensure that all three supported schools are included. You will need to fill in the application form electronically (or scan a handwritten version) and then email it to us only on the specific registration date. We have had job applications from some fantastic-sounding people with a great range of creative and childcare experience! We are interviewing them over the next few weeks. But it’s not too late if you know of anyone who you think should apply to join the CCC Club Team. The Telegraph Hill Centre have completed the basic redecoration of the CCC Club Space. When this is complete, the CCC Club will begin the next stage of fitting out the room and making it a lovely place for the CCC Club kids. On 29th and 30th March we will be running a Work Weekend, where we are asking for volunteers to help us with some painting, putting up of shelves, garden tidying and various other small but vital jobs. If you’d like to take part - even if only for a hour - please let us know. BBQ food and refreshments will be provided by the CCC Club. We have started sourcing the kit and supplies for the CCC Club kids, but there are still plenty of things we need. We will be in contact once we have finalised this list to see if you have anything you could donate. If you know of any local businesses who might want to support the CCC Club by contributing equipment or supplies, or by making a donation, please contact us at mail@thecccclub.org. Posted in Uncategorized on March 19, 2014 by Jake Berger. 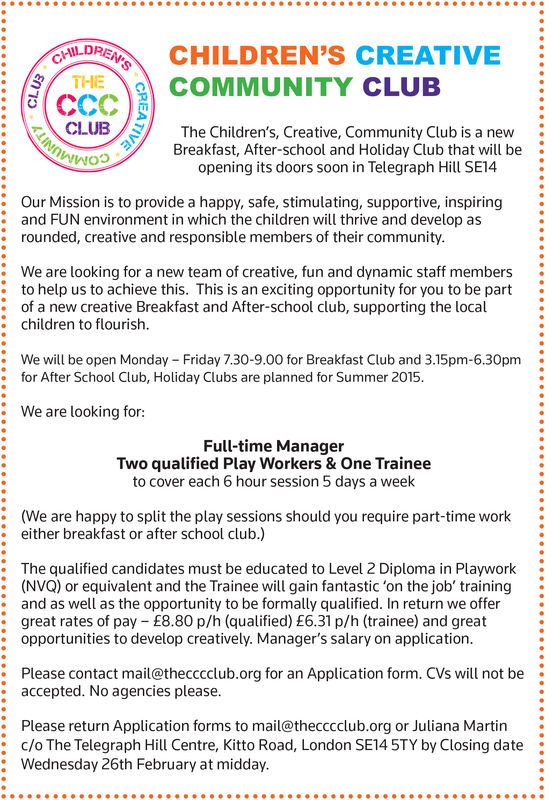 We Are Hiring – 4 Jobs at CCCClub! Posted in Uncategorized on February 10, 2014 by Jake Berger. The message below was sent to the CCC Club Mailing list on 4th Feb 2014. Please email us if you'd like to be added to the mailing list. I thought I'd write to everyone who has expressed an interesting in registering their child(ren) for The Children’s Creative Community Club, to update you all on our progress. So far there has been a good variety in the kinds of care that you have requested: a handful of you are looking for full-time care; quite a few of you want to use the after-school club every day, but it seems that the majority of you are looking for a few days a week of after-school care for your kids. My fellow directors and I will do everything we can to try to address all of your childcare requirements. Suzanne Tate - a CCC Club Director, Waller Parent and Interior Architect - has been working with The Telegraph Hill Centre on the design and layout of the CCC Club Space. We will share more details soon, but you can be certain that we will create a unique and inspiring place in which your kids can play, learn, create and relax. We plan to run the breakfast club from 07.30 - 09.00 every day, and will make sure that children attending have a fun, relaxed and well-nourished start to the day before being dropped off at school. There has been less interest in the breakfast club than in the after-school club, so we wanted to ask you if there was anything we could do to make the breakfast club more useful and attractive to you and your families? Suggestions so far have included yoga, meditation, and story-telling, but what would YOU and your kids like to be offered? Cher Moore, our manager, is about to advertise 3 great jobs at The CCC Club - two playworker and one trainee / apprentice playworker roles, all at 30 hours per week, and paying competitive and fair wages. Perhaps you know someone who might want to apply to be part of the team? We will email you once the Job Descriptions are online. Posted in Uncategorized on February 4, 2014 by Jake Berger. Our OFSTED Application is in progress. We are planning the refit and redecoration of the CCC Club Space. We've had lots of people registering interest. The majority of people appear to want part time places, so we will do our best to balance everyone's needs. We will use the CCC Club mailing list to provide updates on progress. Posted in Uncategorized on January 28, 2014 by Jake Berger. Posted in Uncategorized on January 15, 2014 by Jake Berger. We have won the tender to run a breakfast and after-school club at St Catherine's church. Posted in Uncategorized on January 14, 2014 by andy.